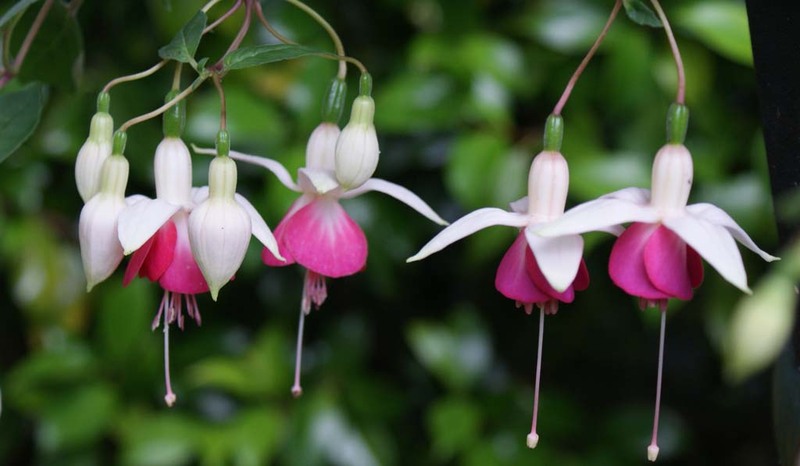 COMPOST & NUTRITION – The National Fuchsia Society of New Zealand Inc.
Fuchsias grow naturally in the warmth, humidity and dappled sunlight on the higher altitudes of tropical and sub-tropical jungles. They are happi­ est in home gardens where those conditions are approximated. 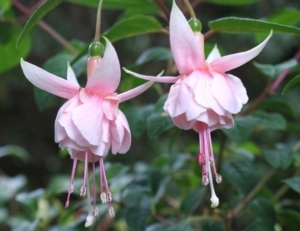 Protect fuchsias from direct sun and dry wind in summer and frost in winter. They like MORNING SUN/AFTERNOON SHADE or FILTERED SUN. They do not like deep shade. 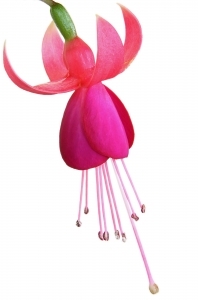 Fuchsias love the 14° to 25° Celsius range but will tolerate higher temperatures if humidity is maintained. They will survive winter lows of -7°C but some of the softer wood types need protection from frost. Fuchsias like to be DAMP but NOT SOGGY. In summer, they like early morning watering and mid-afternoon or evening misting. Avoid exposing wet leaves to direct sun. In winter, only water when required. It is wise to feel the soil before watering. If it is damp but the plant is limp, just mist. Fuchsias are heavy feeders. They prefer a LIGHT feeding OFTEN. A half-strength solution of a complete balanced fertilizer applied for weekly works well, but discontinue late Autumn until plants start growing again in Spring. Fuchsia soil should be LOOSE so roots can penetrate and spread. It also should be SPONGY so it will retain moisture but drain freely. 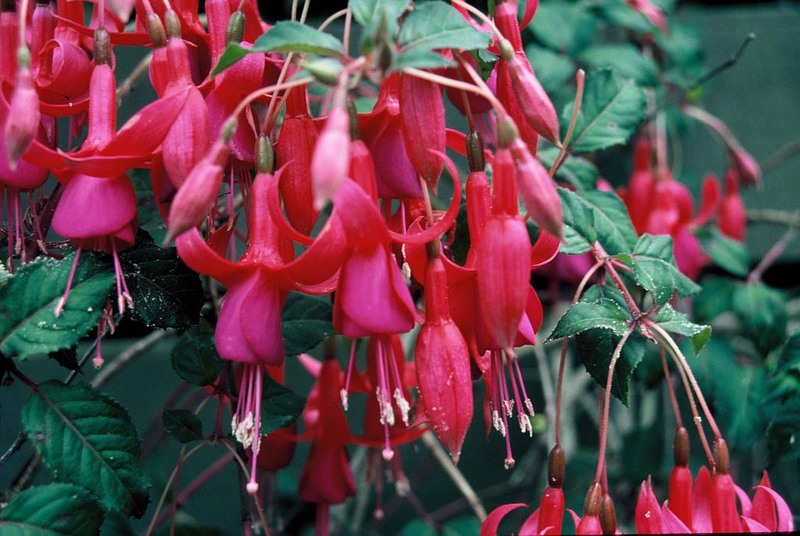 Fuchsias prefer a soil that is loose and well drained. This allows air into the soil and retains moisture and nutrients. There is a wide range of commercial potting mixes that are suitable. In general, these mixtures will contain organic matter (humus) and bulky material such as sand or coarse grit. The bulky material serves to keep the soil loose and open. The organic matter retains the moisture and nutrients. A container holds all the soil, nutrients and root system. A container must allow the soil to drain freely. A fine mesh screen covering the drain hole will prevent the soil from washing out and prevent slugs and worms from entering the container through the drain hole. The basic types of containers are made from clay, wood, plastic, or wire frames lined with sphagnum moss or coconut fibre. Wire and clay containers dry quickly. A container does more than hold soil and plant. It should drain freely and also provide an aesthetic backdrop that enhances the beauty of the fuchsia plant in full bloom. NITROGEN promotes soft green growth. 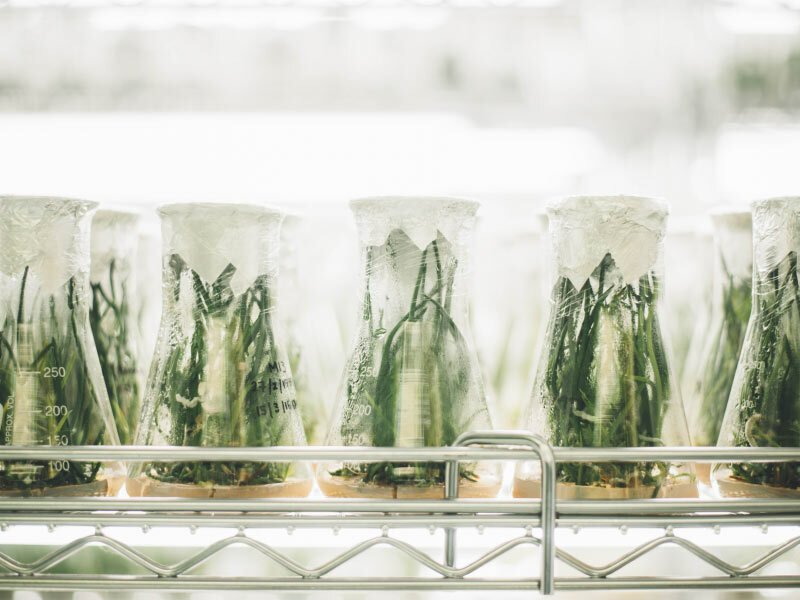 PHOSPHORUS promotes flower and seed production. It also matures a plant, hardens the stems and develops stronger root growth. POTASSIUM regulates the amount of green growth versus flower and seed production. It also increases a plant’s resistance to disease and promotes general vigour. Secondary food elements also are necessary for a plant’s proper growth. Excesses of these elements are as damaging as too little. Most fertiliz­ ers contain the proper amounts of these secondary food elements. 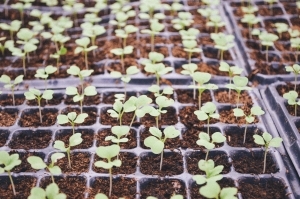 SPRING – After the first green growth appears, feed with a “high nitrogen” fertilizer to promote rapid growth. Fertilize once a month. SUMMER – After pinching is complete, switch to a balanced fertilizer to promote blooming. Feed weekly. AUTUMN – Use a “high phosphorus and potassium” fertilizer to harden the plant for the winter. Feed weekly. WINTER – Don’t fertilize at all. If the above sounds too complicated, use a balanced fertilizer for Spring, Summer and Autumn. Two months before the hard frost date, stop feeding entirely. In all cases, follow the manufacturer’s directions for best results. ALWAYS WATER PLANTS THOROUGHLY THE DAY BEFORE FERTILIZING!